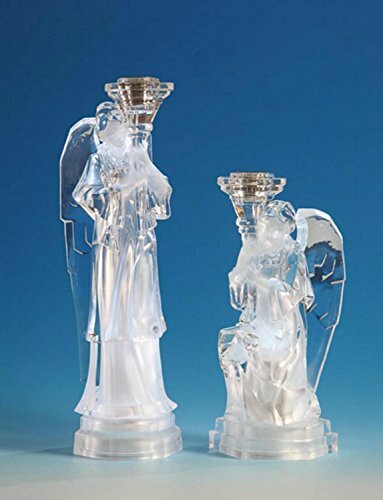 Pack of 2 Icy Crystal Illuminated Christmas Angel Taper Candlesticks 12'' by CC Christmas Decor at Two Clock. MPN: 31002308. Hurry! Limited time offer. Offer valid only while supplies last. From the Icy Crystal Christian Spirit Collection Each features two angels, one standing and one sitting, with the elegance of ice sculptures. Set of 2 Snow Drift Grey Antique Style Tea Light Christmas Candle Holders 22"
Set of 2 Snow Drift Grey Antique Style Tea Light Christmas Candle Holders 27"
Pack of 6 Red Christmas Indoor/Outdoor Tea Light Candle Lanterns 18"